Your wedding is a love story. Award winning artists Aggie Whelan Kenny and Elizabeth Williams, whose illustrations have been seen all over the globe, capture the love, joy and ceremony of your wedding in a unique, fairy tale story book. 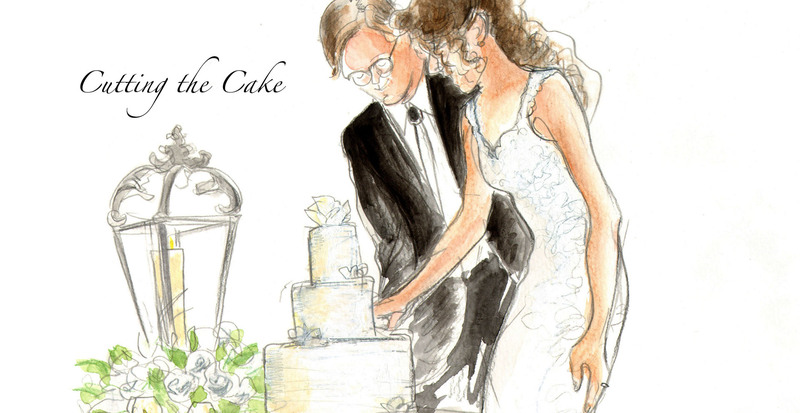 The artist duo creates a stunning collection of original illustrations of your wedding day. Trained to work quickly and unobtrusively, Elizabeth and Aggie illustrate the special moments of your wedding. The drawings are then hand-painted and transformed into a custom book which you will treasure for years to come. Aggie and Elizabeth meet with the wedding couple to determine priority pictures, such as scenes, guests, and special moments — from the ceremony through the reception. They offer suggestions as to “must capture” moments, and help identify the unique images that will make up your very own “Illustrated Courtship”. © 2018 Illustrated Courtship. All rights reserved.